In the application of plaster to external or internal walls it is first necessary to make the surface rough, in order that plaster may obtain a good key. This is obtained by raking out the joints of the brickwork and hacking the surface of the bricks. In cases, however, where the bricks are rough in texture this is unnecessary, and the plaster can be applied direct. It can, however, readily be seen that it would be impossible to plaster direct on to floor joists or the quartering of wood partitions. They must therefore be prepared and rendered suitably to receive the plaster, and the preparation used must be of such a nature as to present a rigid surface, and at the same time form a good key. This is called lathing, and consists of nailing thin strips of wood (called laths), expanded metal, or wire, on which the plaster can be laid or pressed, so that it is forced through the interstices and protrudes on the back, thus forming a good key when dry. Oak laths have a tendency to warp, and are not often used. Sawn laths are similar to those above described, differing only in the fact that they are sawn, and are therefore more uniform in size. The length of a rent lath is from 2 feet to 3 feet 6 inches, while sawn laths are generally about 2 feet long. Although sawn laths are much used on account of cheapness, rent laths should be employed in all good work. Laths should be fixed about 1/3 inch apart with iron clout nails from 3/4 to 1 1/4 inches in length. These may be galvanised, wrought, or cast. The first named are preferred for fixing oak laths. Many architects object to the use of iron nails, on account of their rusting and staining the work, and in any case it is wise to paint or gas tar the heads of the nails before the first coat is put on. Zinc nails are often used to remedy this defect, but they are expensive as compared with those of iron. inch wide by 1/2 inch in thickness, to the joists if under a floor, as shown in Fig. 256, or to the studs on a partition, and the laths are then nailed to these. This is called brandering. Another method of overcoming the difficulty is to nails laths, called counterlaths, along the joists or studs in the direction of their length, and then nail the laths to these. As it is the object of all architects to render buildings as fire-resisting as possible, wire netting is often used to receive the plaster. The netting should be galvanised, about 3/4-inch mesh, and secured to the woodwork by small galvanised staples. It can also be used effectively where girders and columns have to be encased in plaster, and should then be secured by being wired to its support. Approximate Weight per yard super. 1 - 1/8-inch mesh, 24 B.W.G. .
26 - 1/4-inch mesh, 24 B.W.G. .
77 - 3/8-inch mesh, 24 B.W.G. 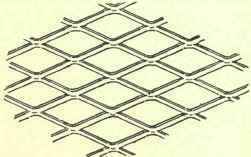 78 - 1/4-inch mesh, 24 B.W.G. . The lathing should be securely fixed, so as to ensure a level and rigid surface to receive the plaster. To obtain the strongest and stiffest ceilings, the metal should be fixed the long way of the meshes across the supports. For ceiling or wall work the bearers may be from 12 to 14 inches apart. To these the lathing should be fixed by wire or clips if to ironwork, or by staples if to woodwork. If the supports are more than 14 inches apart a stouter gauge should be used. Where joints are made in the sheets they should be lapped. If the lathing is rigidly fixed the thickness of plaster need not exceed half an inch. The lathing used for plaster is given one coat of oxide of iron paint before leaving the works, but it is also sent out galvanised if required. Apart from the superior key it affords, the plastering done on this lathing is practically fire, damp, and insect proof, and fire tests up to 20000 Fahr. have failed to remove the plaster or damage the metal.